I have recently been on somewhat of a ‘modern image’ binge. 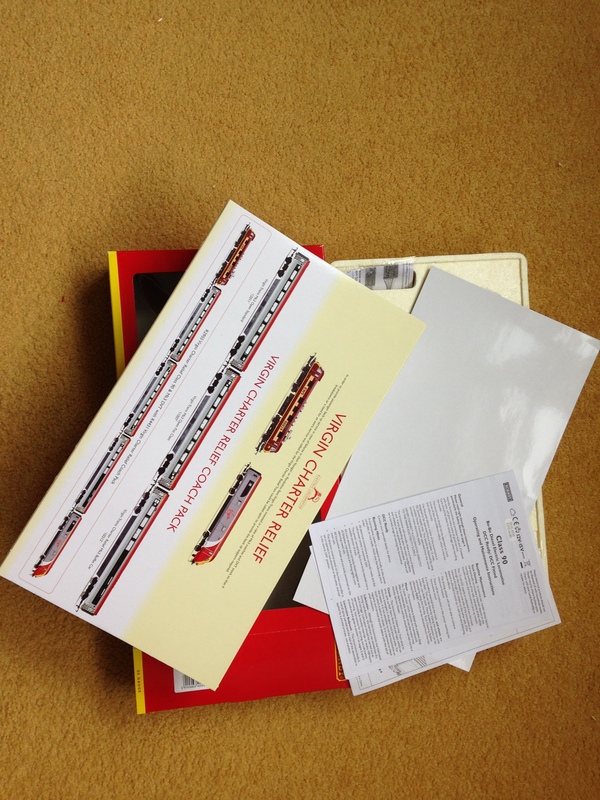 As well as the Class 67 previously reviewed I’ve added to my collection by having a go at recreating the Virgin Charter Relief ‘Pretendolino’ (R2955) formation. In 2008 Virgin leased a Class 90 and Mark 3 coach set & DVT (Driving Van Trailer) from the then EWS to supplement their rolling stock after the loss of a Class 390 Pendolino unit in the Grayrigg derailment. In 2009 the coaches were refurbished and re-liveried to bring them in line with the decor and finish of the Class 390’s. This earned the set the nickname ‘The Pretendolino.’ It’s mainly used incase of a Class 390 shortage but is also in regular relief service on Friday’s between London and Birmingham. The Class 90’s themselves were built between 1987 and 1990 in Crewe, designed to replace Classes 81 through 85 for use on the electrified West Coast Mainline using the 25 kV Pantograph and Catenary system. They produce 5000 bhp and have a top speed of 110 mph, though they more commonly operate to 100mph with passenger coaches in tow. Some have been limited to 75mph for freight only operations. The 90’s have had a mixed and varied life and are a current mainstay on electrified routes in Britain. They were originally used on BR Intercity formations, Postal Services and Railfreight Distribution operations on the West Coast routes. Since privatisation the Class 90’s continue to do these jobs for their successor companies, Virgin Trains, EWS/DB Schenker and Freightliner whilst also being deployed on First ScotRail Sleeper services and Abellio GR routes on the Great Eastern Mainline to Norwich. For passenger operations the Class 90’s are operated in formations with Driving Van Trailers (DVT’s) enabling them to be remotely operated from the opposite end of the train in a push-pull mode. This removes the need for locos to ‘change ends’ at termini stations. 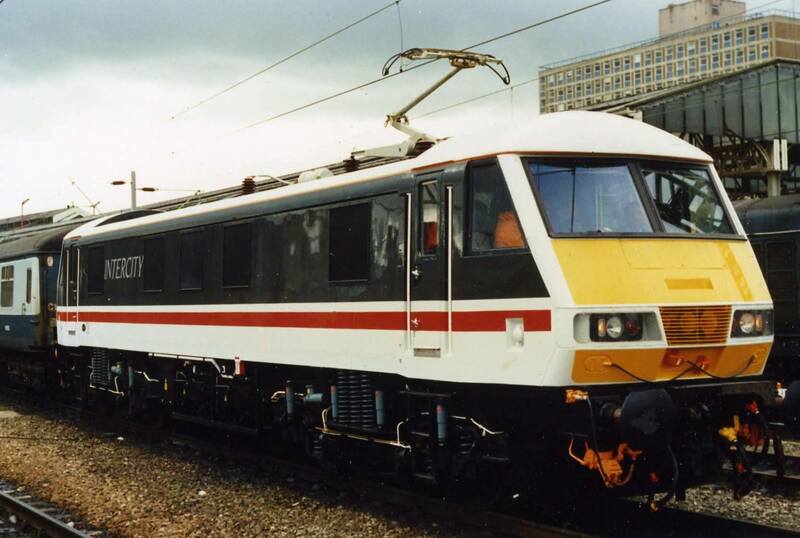 Unlike the Mark 2 DBSO (Driving Break Standard Open), which was a remote cab retro fitted to a standard passenger coach, the Mark 3 & 4 DVT’s were purpose built and styled to resemble the Class 90 and 91’s they’d be operating with. Legislation of the time also prohibited any passenger accommodation in lead vehicles designed to travel over 100mph, hence their secondary use as luggage vans. In recent years some Mark 3 DVT’s have been adapted to work with the diesel Class 57 and 67’s for Wrexham & Shropshire and later Arriva Trains Wales routes. Other liveries are available, including the Arriva Trains Wales version in a very smart turquoise and the ever fun rainbow coloured One Railways edition. Naturally though, they are all sold separately to their respective coaches. 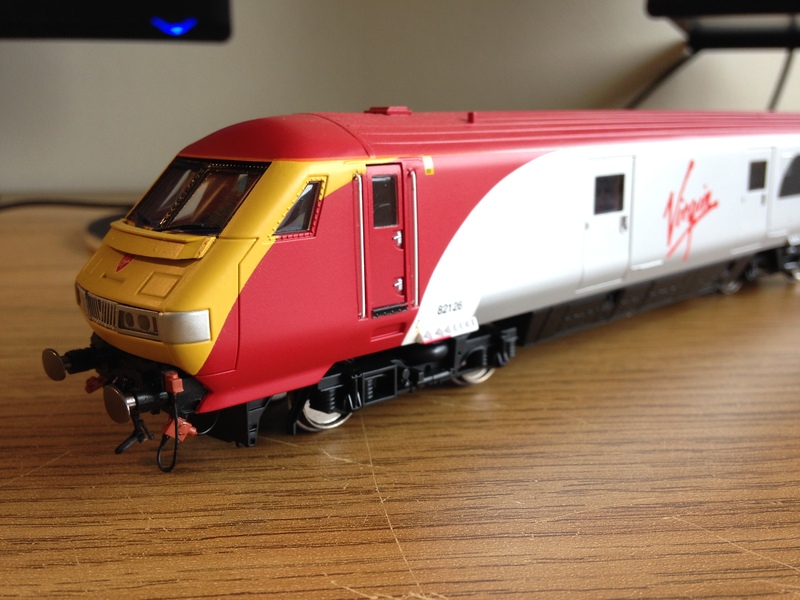 Curiously the only way to buy the Virgin DVT is to buy it with the EWS Class 90 in this train pack. You can’t buy it on it’s own. (Well actually you can from Hatton’s in Liverpool who split up the pack but this does give you an incomplete box – more about this later…). 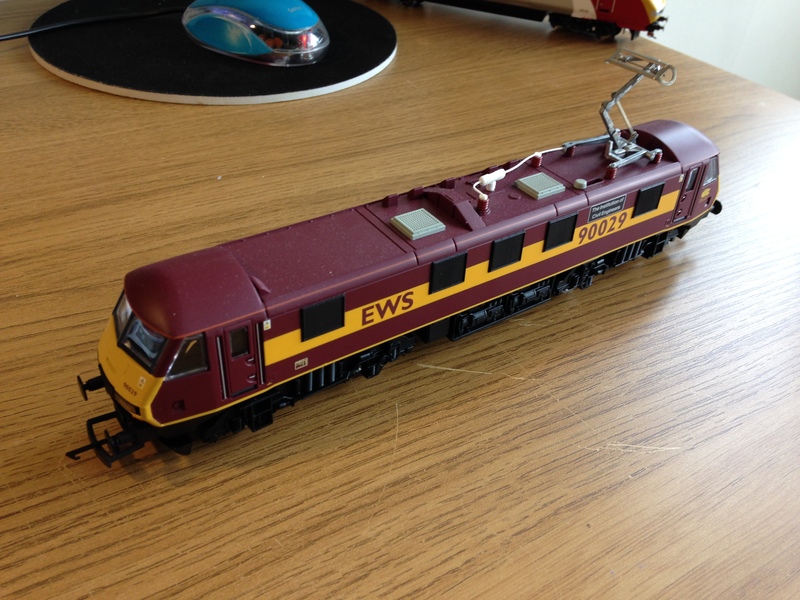 As for the Class 90, naturally you can buy this stand alone, EWS or otherwise. This is a fairly old release so none are actually in the 2014 catalogue but you’ll definitely still be able to find these new in model shops up and down the country. A noteworthy flavour includes the blue First ScotRail edition for the Calendonian Sleeper – and just to confuse you even more – you can pick this version up in a pack with accompanying coaches (but no DVT in this formation). Bachmann have also just announced they are dipping into the Class 90 market, with Freightliner and Intercity versions available. 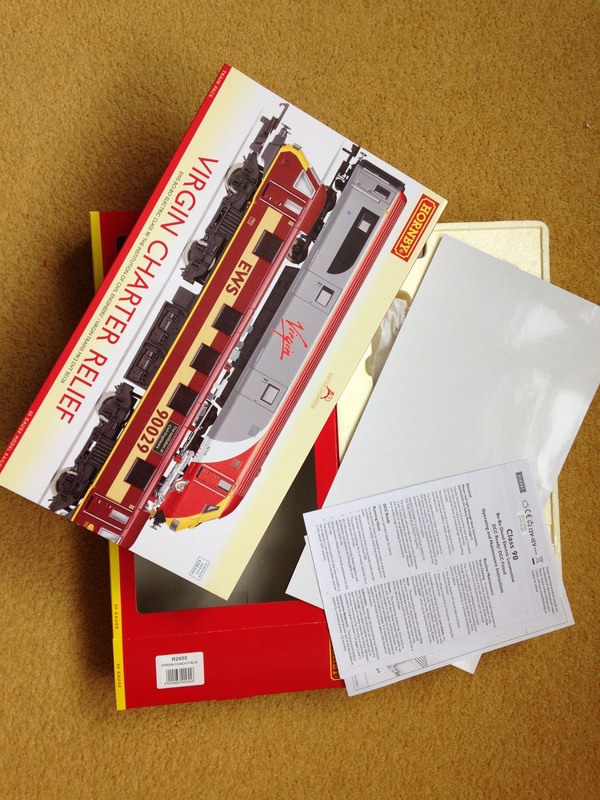 The classic Hornby windowed box, Styrofoam body, with card insert so you can’t actually see the model in the shop – Stop doing this Hornby it’s really annoying. It does come with a printed sleeve, which will sit nice alongside similar boxes. Unlike some other models, this sleeve doesn’t come with a little blurb or model summary on the back. Instead you get details of how to supplement the formation with the separately sold coach pack, making you feel like you’re buying a toy rather than a model. NEM pockets for your choice of coupler. A medium hornby tension lock is provided on both the 90 and DVT. Note: There is no facility to couple from the cab end of the DVT. 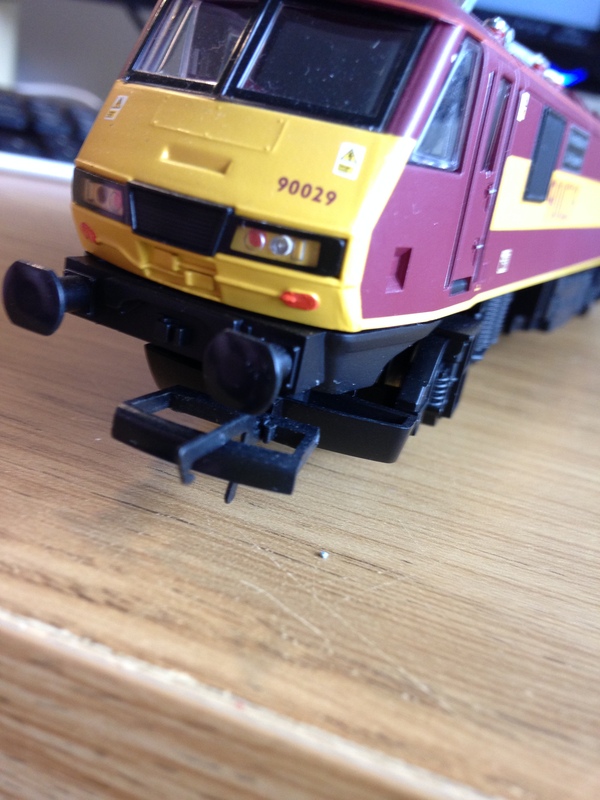 Sprung metal buffers – cab end of the DVT ONLY. All wheel pickups on both the 90 and the DVT (any power functions operate independently of each other). Two axle drive 5 pole motor (90 only) with traction tyres. Both DCC ready but not fitted. Note: If you do want to DCC this set you will need separate chips for each vehicle. Directional lights – 3 forward marker lights and 2 rear tail lights – DVT ONLY. Accessory bag, consisting of two vacuum pipes to fit to the DVT. It should be clear from that list that there is an obvious mismatch in the standards and quality of the two vehicles. It appears we have up to date tooling for the DVT whilst the loco remains a bog standard Class 90 Hornby have been producing for years – no lights, no sprung buffers, traction tyres etc. Some might even go as far as saying the Class 90 provided is a rail road version, although I perhaps wouldn’t go that far. 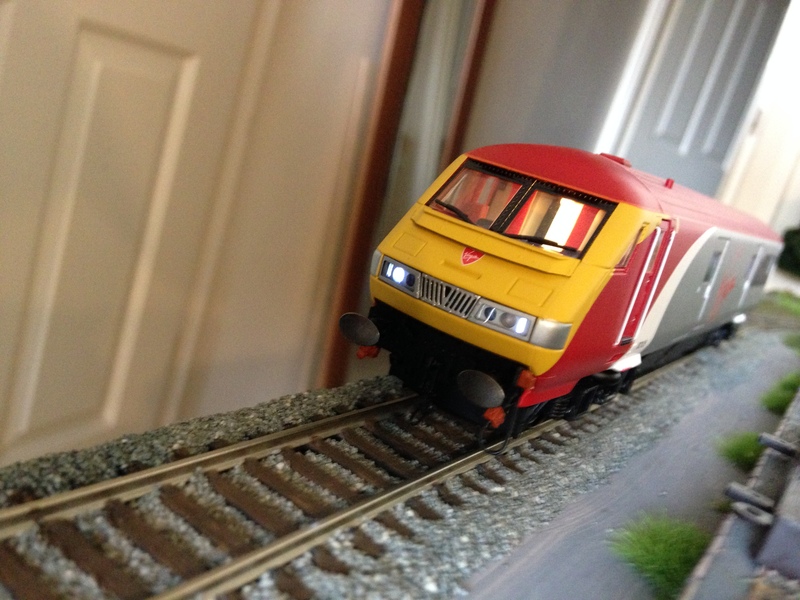 It’s certainly disappointing that the Class 90 is not as well equipped as it should have been, and this has been well documented on modelling forums. This is a similar story with the Wrexham & Shropshire 67 & DVT train pack – although I think this version of the loco at least has forward direction lighting. It should still be noted that the DVT is excellently equipped and is to be honest the reason I bought this pack. Starting at the ends, to be honest there’s not a great deal to write home about. The lights are painted on behind clear plastic casing which some have noted should really be fully black to be properly prototypical. There’s no wipers on the windscreen but there are some warning signs and what looks like moulded multiple working sockets painted orange. The underframe is one big piece of moulded black plastic, which includes the buffer beam and buffers. There aren’t even vacuum pipes and any accessories to fit to make it look more interesting – though I’ve seen some YouTubers borrowing spares from other locos to tart it up a bit. It’s also worth mentioning part of the valance is attached to the boggies. 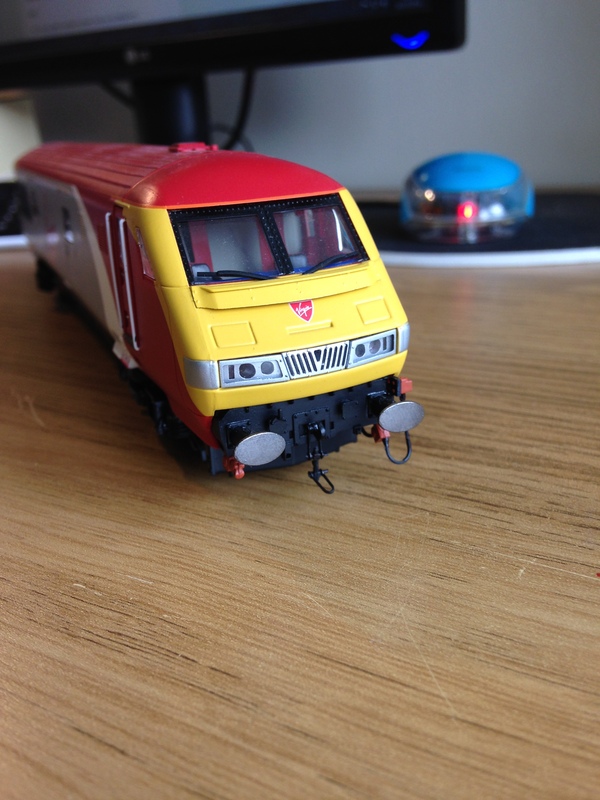 Again, those looking to improve their Class 90’s have chopped this off and permanently attached it to the base of the model, sacrificing the ability to couple at both ends. Although that underframe is one piece of moulded shiny plastic it’s still got tanks, pipes and equipment boxes in all the right places. 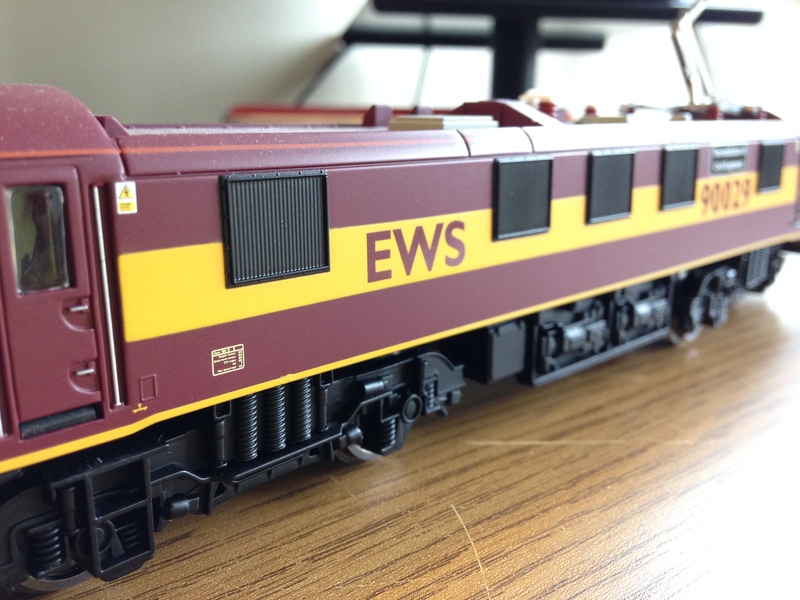 Having checked photos of the real EWS 90’s none of this was painted any other colour than black anyway – so Hornby’s recreation is pretty accurate! Finally the roof. More moulded plastic I’m afraid, but at least the cabling and insulators for the pantographs are coloured and fitted separately. As a sign of how old the tooling is, you’ll find a switch here to enable the loco to be powered from Hornby’s overhead catenary system with the pantograph. This system dates back to the late 80’s and has long since been discontinued so whether these switches still work is a mystery to me! Maybe someone better informed could let me know… Either way it speaks of a time when this unit would have been seen more as a toy, where it wasn’t necessary to hide such switches which now look out of place. The cab end is excellently detailed, everything is where it should be. You’ve got riveted windscreen frames and raised wipers protruding from the body of the vehicle. The ‘Virgin’ logo shield is neatly applied, although it’s a little too far up the cab to be correct. Plenty to look at on the underframe here with your sprung metal buffers, multiple working cables, real chain-link coupler (don’t forget there is no NEM facility this end of the vehicle) and holes for the vacuum pipes if you choose to fit them. It would have been nice if the lighting bracket and grill was etched metal, but you can’t have everything. 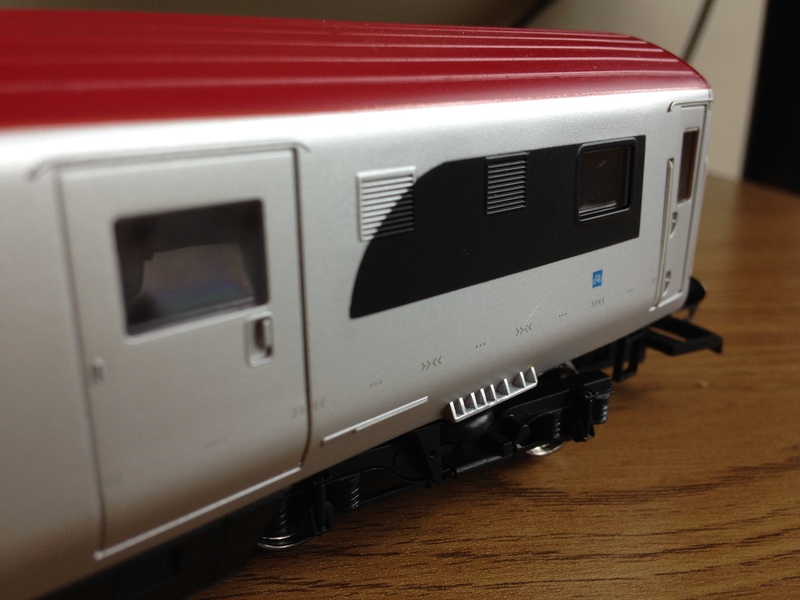 As for the lights themselves, correctly you get 1 headlight and 2 white marker lights in the forward direction – although they are all of the same luminosity unlike some other Hornby models. 2 red tail lights and a warm white cab light complete the look. 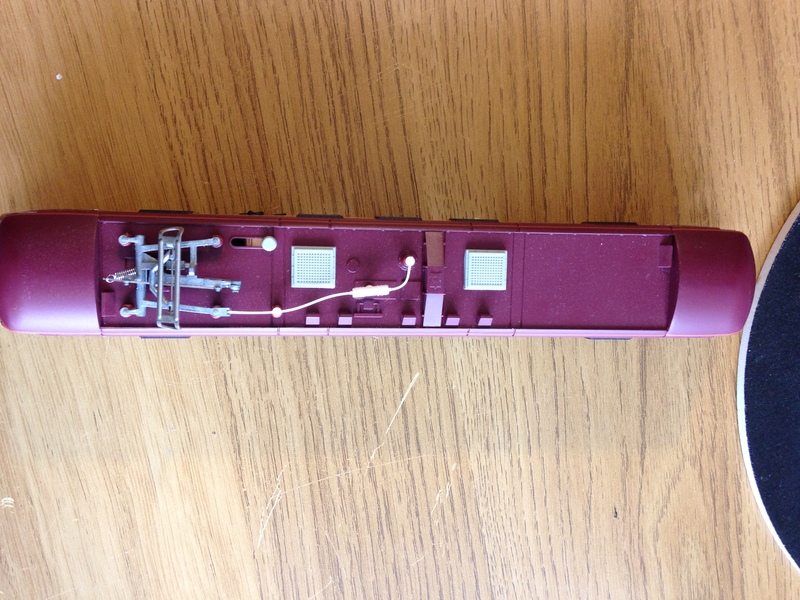 To highlight the upgrade in detail, above is the Hornby DVT of old (all be it the differently shaped Mk IV). A big improvement! 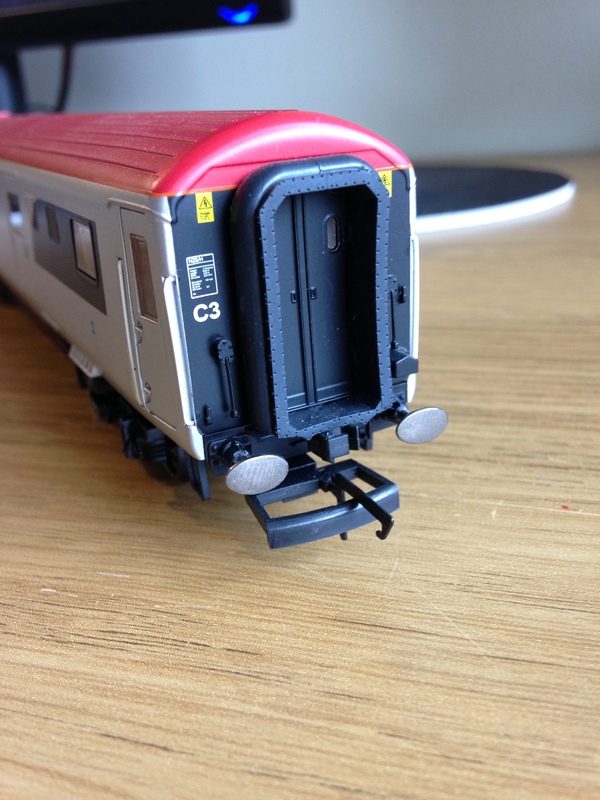 Moving down the side now… Hornby have given us working cab doors, which for me will probably never see much action, but it’s a nice addition nonetheless. Recessed handrails and door handles in all the right places. The underframe may look boring, but to be honest there’s not a lot going on down there in real life! Striking application of the Virgin livery, that silver colour is slightly metalic in finish but not so much so that it doesn’t fit in with the rest of the paintwork. Some fine detailing down to the warning signs, bike storage symbol and chevroned stripe really complete the look. 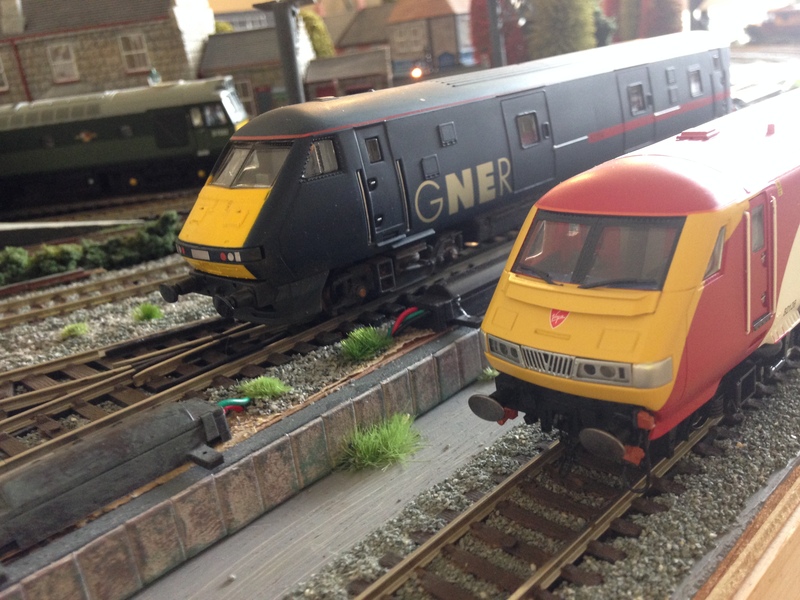 The model has the running number 82126. At the rear, more warning symbols and route availability transfers. You also get a fake coupler, metal buffers, and the port holes in the doorway have real windows – nice! Rather uniquely, in the fact I’ve not seen it anywhere else yet, the interconnecting gangway frame is rubberised. Almost as if Hornby had forgotten to add it and then did at the last moment… It doesn’t detract from the overall model, in fact I think it gives it an accuracy most gangway’d vehicles lack. My only gripe would be that it might look out of place up against all other plastic ended stock! If you’ve come here for the DVT then it’s popularity is well justified it’s a fantastic model with some well thought out touches. If you’ve come here hoping for an updated Class 90, well you’re going to be disappointed. Don’t get me wrong, I like it, but sitting next to my DB Class 67 it really looks like a dated model. For a model with fairly old tooling, it runs very well. At a reasonable speed the 90 is smooth and the motor has a nice electric hum to it (sort of fitting really!). Even though it’s got traction tyres, it’s not going to win any awards for strength, especially up hill. If you’re using tension lock couplings, I’d recommend leaving on the medium ones provided rather than changing to any slim line versions. 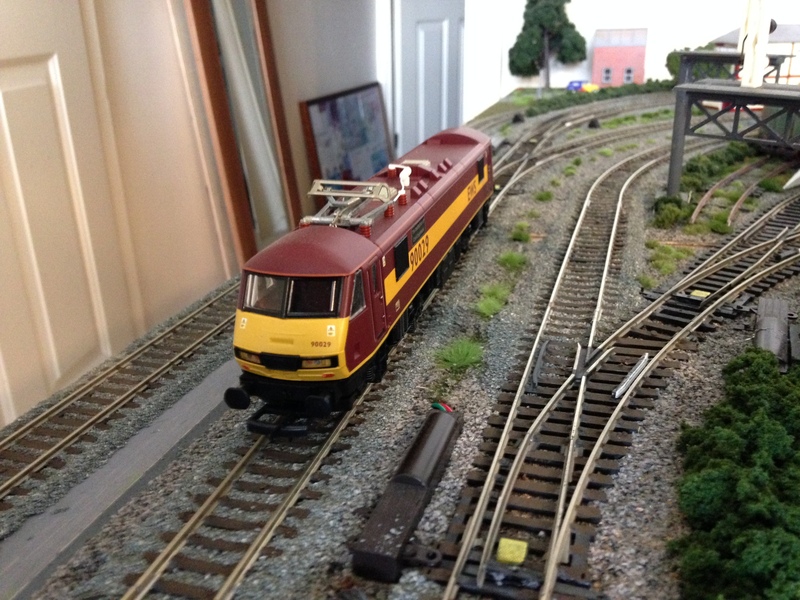 I’ve found whilst using the slim variants, other rolling stock’s coupling seems to get caught up in the 90’s buffers and derails – especially on tight curves. The medium couplers also have a bigger lip on them. This really helps when the loco is pushing coaches (the Hornby Mk III’s also have medium tension locks) as the couplings don’t get caught up amongst themselves. This problem is true of a lot of stock using sprung loaded slim tension locks whilst running in reverse, and isn’t isolated to the Class 90. The first I bought stand alone, from the aforementioned Hattons. The forward directional white lights on this first purchase didn’t seem to work very well. Putting this down to a loose bit of soldering I naively thought, ‘ah – I can fix this no problem…’ It turned out that all the soldering was fine, it was the actual LED component itself that was faulty. Unfortunately by the time I’d figured this out I’d broken a couple of pieces of the plastic frame. Not major pieces, but pieces that meant I could probably no longer return it. 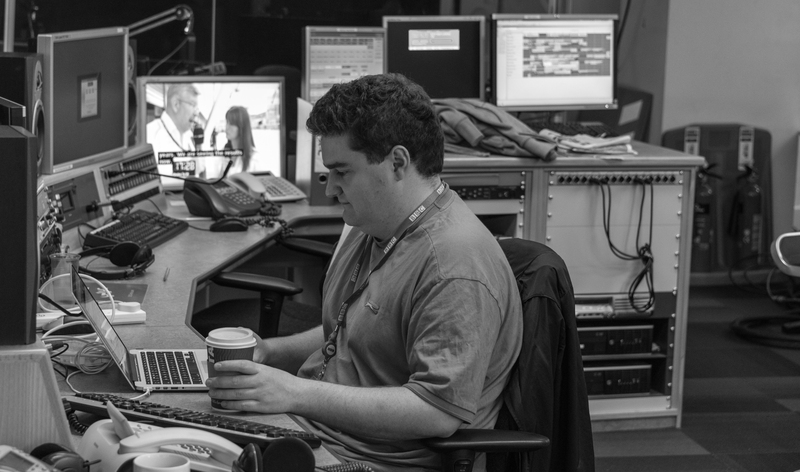 Lesson learnt – better to return it than try and fix it! 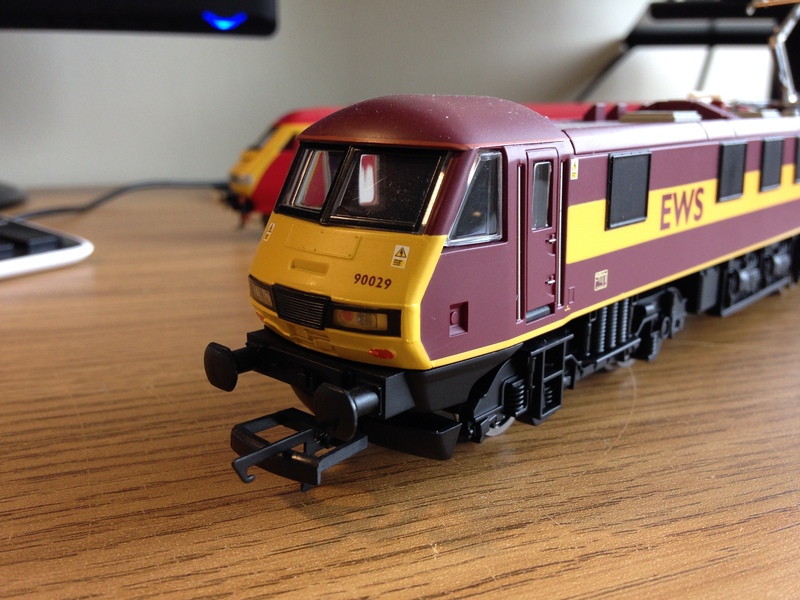 So chalking this one up to overconfidence on my DIY skills and seeing as I’d already bought the coaches to run with it (my original intention was to run the set with my Class 67, a bit Wrexham & Shropshire style..), I thought I better buy another. Only this time I thought I might as well do it properly and get the set. Thankfully, it was! The new DVT’s lights work fine. They were flickery at first in both directions even under reasonable power. Now the model has been run in they are much more reliable and stable. I’m not quite sure why this might be, contacts bedding in maybe? So overall a decent effort. There are certainly better runners out there than the Class 90 but it’s not going to cause you any grief with the right couplings either. Hopefully the faulty DVT was a freak occurrence so I won’t mark it down to harshly for this, but be aware your model may need running in before those lights are stable and flicker free. The original RRP for this when it was released I think was somewhere around the £150 mark. Considering you can pick up a DVT stand alone in other liveries for £48, this implies the Class 90 is somehow worth £100! I don’t need to tell you that there are far better models to buying for £100, and that Hornby’s initial valuation of it’s un-updated Class 90 is quite absurd. Thankfully Hattons and Rails of Sheffield will do you the pack for the more saner £100. That brings the loco price down to about £50, which is okay but still not the bargain of the century, especially as the loco could have been a hell of a lot better. Having said all that the price of a stand alone DVT is pretty steep considering it’s just a coach with some LEDs. I suppose it’s because it has the facility and appropriate circuitry for DCC chipping, but for me it does make it somewhat pricey. Shop around though and you should find this pack on eBay for about £75. Yes, the DVT is a quality model – and I’d definitely recommend you get one in any of the available liveries. I was originally turned off this pack when it was first released due to the price and the fact the loco doesn’t have fully up to date tooling. However, since the price has dropped I’m able to (just about) justify the cost of the loco element. 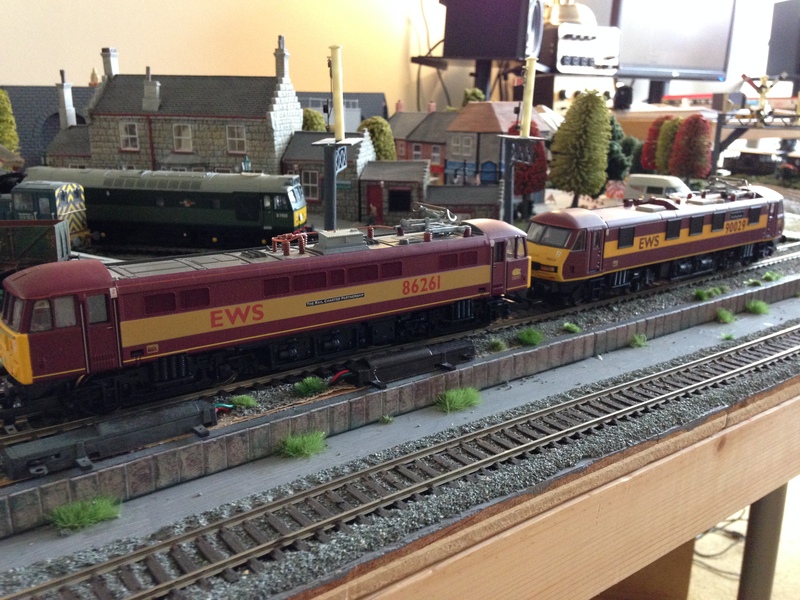 I also already have a Class 90 and an EWS Class 86 so I now have the option for some interesting double headed formations. All that being said, you really have to be committed to investing in the Pretendolino Charter formation as there are far better ways to spend the money. Don’t forget that you’re not really going to buy this without the coaches, which at £25 a go, makes the cost add up! These didn’t fly off the shelves when they were first released but now the virgin set is becoming increasingly harder to find (especially the coaches) which may actually make this a sought after edition to your collection. My honest advice though, get yourself an Arriva Trains DVT and accompanying coaches, just as smart and you’ll save yourself 50 quid which you can put towards a Class 67. 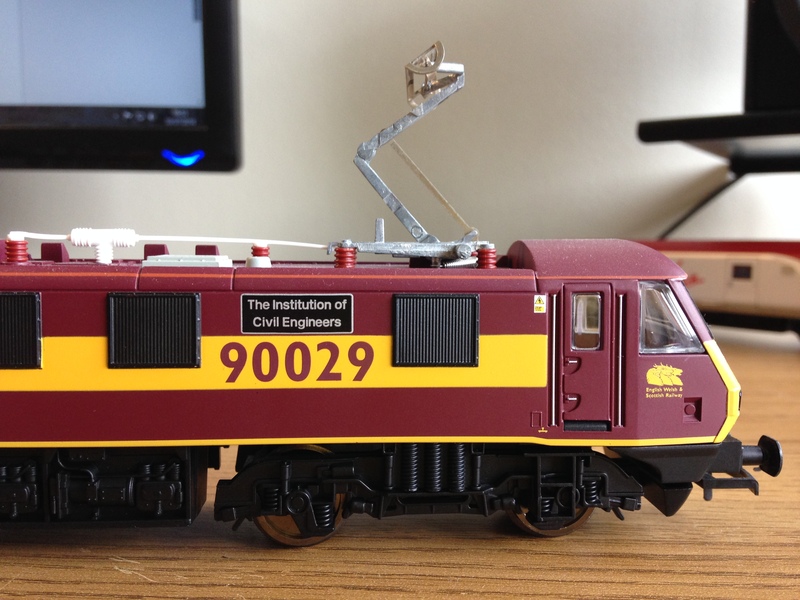 If you’re wanting a Class 90, wait for the brand new Bachmann editions this year. It’ll certainly come with all mod cons including a better motor and directional lighting – Hornby really have missed a trick! If they don’t do the livery you want, I’m sure Olivia Trains will make professional resprays available over time. Just a quick word on the coaches, which naturally you’ll want to complete the formation. Lot’s of nice fine colour detail, excellent livery application, and despite the medium tension lock coupling the spacing between coaches isn’t enormous. In fact, in push mode it betters some close coupling alternatives! 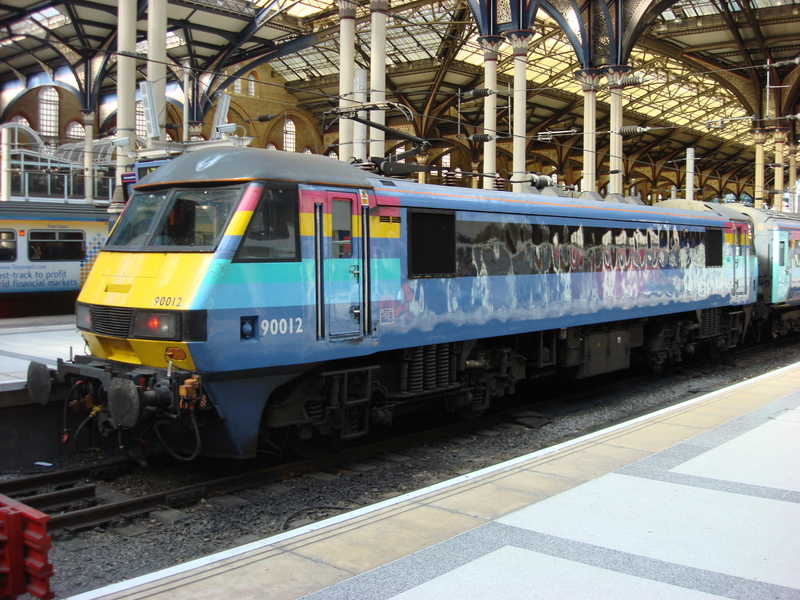 These certainly are up to the standard of the DVT, which will only make the Class 90’s inadequacies stand out more. As I said previously an individual coach will set you back about £25 and are quite easy to come across. You may have to buy two or three identical coaches and then renumber for a full rake. Hornby used to do a set of 3 (R4431), which has now become so hard to find the price for a brand new pack far outstrips the loco and DVT! Coach packs do sporadically pop up on eBay 2nd hand for a more reasonable price but these are becoming increasingly rare.